Wow Vigan. We looked for the McDonalds as we alighted from the bus. It served as my landmark to Calle Crisologo. We’re tired, and I was hungry. 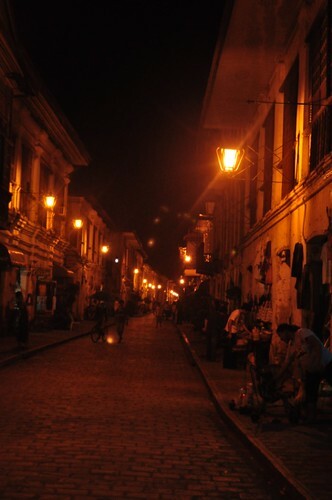 Vane has a friend who lives in Vigan, and her friend told her that it’s good to take pictures at Calle Crisologo during at night. As we crossed the street, we saw the Vigan Cathedral, and on its side were Chowking, Jollibee and McDonalds. We went to McDonalds first, grabbed a snack and relaxed for awhile. Afterwards, we headed to Calle Crisologo. It was just 5 minutes walk. We passed by the Plaza Burgos first before reaching the Calle Crisologo. As we are approaching the famous Calle Crisologo, we saw the Max’s Restaurant. Wow, is it the 1st Max’s in the country? The street is neat and calm. There are kalesas. There are stalls selling souvenirs. And we were surprised that there is a gimikan along the Calle Crisologo. Afterwards, we went back to Plaza Burgos to meet Vane’s friend. He was kind enough and he took us to our lodging, Casa Teofila. It was already 10:00 PM when we arrived at the Casa Teofila. As we entered to our room. We fixed our things, washed up then slept. 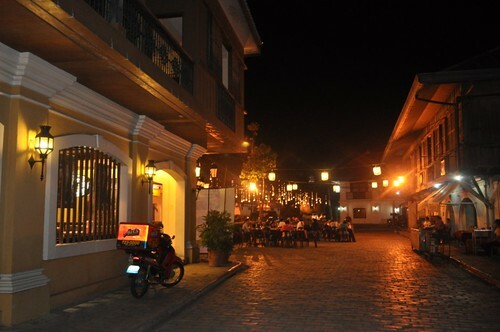 Goodnight Vigan!